Nissan Group's January sales took it on the chin in the name of reforming its past sales habits. Without its usual reliance on fleet sales and incentives, the group's U.S. sales tumbled 19 percent to 100,741 cars and light trucks in January. Nissan Division sold 90,439 vehicles last month, down 20 percent from January 2018. Infiniti sales dipped 3.1 percent to 10,302 vehicles. In a market heavily favoring crossovers and pickups, the Nissan brand took a hit in those segments as well. Its light-truck sales dropped 16 percent last month, compared with the same period a year ago. The brand suffered year-over-year sales losses in all light-truck models, except its Frontier midsize pickup and NV commercial van. 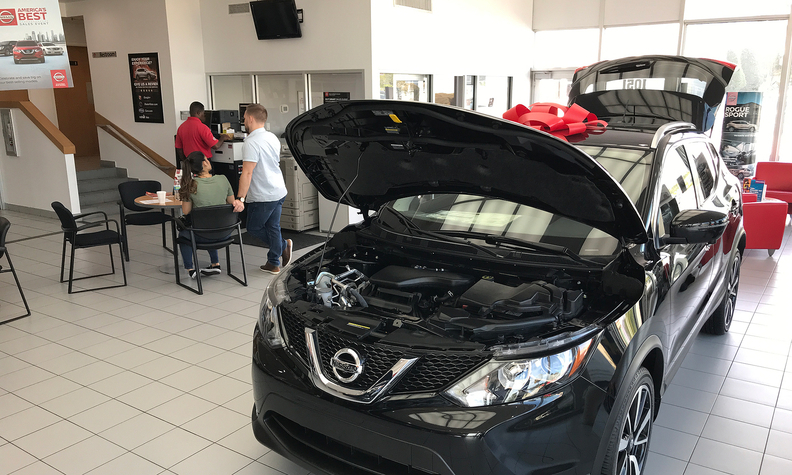 Billy Hayes, division vice president for Nissan regional operations in North America, said the sales drop is a symptom of Nissan's ongoing effort to reduce overall fleet sales while boosting its retail and commercial fleet business. "We had a big fleet year last year, and that accounted for most of the difference in sales that you're seeing there," Hayes said. He declined to break out fleet and retail numbers. Turning that business model will take time, Hayes cautioned. "It's not an overnight process," he said. "We're in much better shape in terms of doing a healthy business, and dealer profits are coming back as well." Infiniti light-truck sales fared better, rising 7 percent over the same month last year, fueled by the QX60 and QX80. But sales of the brand's newest star, the redesigned QX50 compact crossover, nose-dived 22 percent in January over the prior year. Infiniti dealers and the manufacturer are counting heavily on the success of the QX50. During the NADA Show last week, Infiniti dealers said they have been pressing the factory for more production of the new crossover. A year ago, retailers and factory officials both stressed their determination to keep production of the model low at first to make sure the all-important product did not end up with an oversupply just as dealers were getting it established in the market. But dealers now indicate they need more production. "This is the car in the largest segment — 35 percent of the market in North America is the D-SUV segment," Infiniti global boss Christian Meunier told Automotive News. "We need to take our unfair share in that segment." Infiniti, which made its name with the G sedan model line, is in a tough spot as demand for sedans cools, said Akshay Anand, executive analyst at Kelley Blue Book. "With the G gone, Infiniti is searching for a brand identity and another heavy-hitting model," the analyst said. Incentives: $4,188 per vehicle, up 0.7% from a year earlier, ALG says. Average transaction price: $27,403, down 0.1% from a year earlier, according to ALG. Quote: "We're extremely bullish on the year; we've got new products coming out; Altima is picking up, especially all-wheel drive," Hayes said. Did you know? The Nissan brand's three biggest volume models -- the Sentra, Altima and Rogue -- all saw double-digit year-over-year sales declines in January.